subroutine Do 1 net damage unless the Runner pays 1credit. Although it has the potential to deal net damage the runner will all but never ever ever ever! Not have the 2 creds needed to pay off the routines. If pup deals net damage ever at all it will be because the runner values his current hand less than his current creds. What Pup really does is tax your opponent 2 per run on that server. For a low initial cost of 1 cred Pup can build up a financial advantage over time, after 4 runs on that server the runner will have paid 8 . Pretty devestating for such a small dog. Despite the strong tax Pup is still not an autoinclude, Pup is leaky like hell and hardly strong enough to deter runs. A breakerless runner laughts at it. Also Pup is the kind of ice you want to play immediately, the sooner it starts taxing the better. This often results in Pups finding themselves behind your ETR ice, potentially rendering them useless whilst at the same time rendering outer ice more expensive. 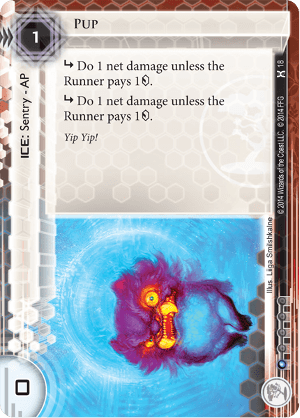 Pup is effective for any deck that wants to tax the runner but doesnt mind leaky servers. For just 1 inf it is easily splashable. Pup operates similarly to Pop-up Window, the two ice are near interchangeable.